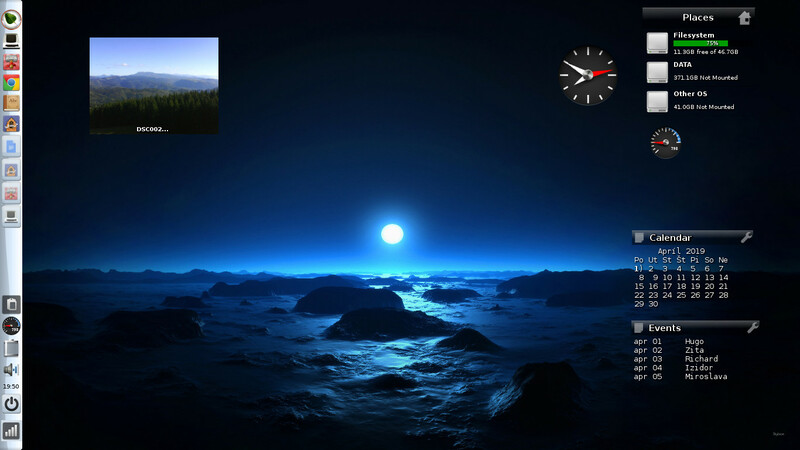 I am trying use the photo gadget to change wallpapers quickly and often. Tried to install several desktop slideshow utils, all to no avail. Photo gagdet seemed to be a solution, but I am not able to change background with it. Gives an error of "Photo needs e17setroot". It also list an e-utils package where this supposed utility can be found, but I cannot find that package, let alone install it. I realize that moksha actually creates another type of file to display as a wallpaper. I believe this e17setroot will create the .edj file so the image will then display as a background. Is it possible that e17setroot exists and I am just not able to find it? and a few others that set images on the root desktop, that come with the window manger. mh5000 is a stand lone, like xsetroot, and hsetroot, and has a multitude of options that go beyond all of the others others shown here(shameless plug), and they are for a window manager, not desktop environment. Last edited by BW-userx; 04-01-2019 at 08:19 AM. Last edited by the_waiter; 04-01-2019 at 10:21 AM. OK in BL5.0 repo now. Wonder why we missed that one? Interesting, ok the photo module is fairly old and I suppose no one tried to use the set as background option it provides and reported this error to us. I never tested that functionality myself. Regardless tho at some point in the history of e17 this worked. The program e17setroot is found in the legacy/subversion-history.git on the e-git website. Hid deep at OLD/e_utils/src/bin/e17setroot. The OLD part means it is probably broken and may not even compile much less work. I will check that out when I have some free time. But to the point regardless whether or not e17setroot works as expect and is safe to use on Moksha this module needs fixed to not use that. Moksha/e17 has its own code to set and unset backgrounds that the module should be using. One of us needs to fix this. Hmm, I realized I have never tried the photo module feature for setting a picture as a wallpaper. But yes, I can see "Photo needs e17setroot" popup as well. Beside this, I can see the photo gadget working flawlessly on my screen. EDIT: I can see also "exhibit" as default picture viewer. We should change it to ephoto or xdg-open. Last edited by the_waiter; 04-01-2019 at 01:02 PM. Gives an error of "Photo needs e17setroot". It also list an e-utils package where this supposed utility can be found, but I cannot find that package, let alone install it. # This script is run by Variety when a new wallpaper is set. You can use Bash, Python or whatever suits you best. # login screen or whatever you desire. WIDTH="$(echo "$DIMENSION" | cut -d/ -f1)"
HEIGHT="$(echo "$DIMENSION" | cut -d/ -f2)"
IMAGE="$(echo "$WP" | sed 's/[^[:alnum:]_-]/\\&/g')"
ASPECT="$(echo "scale=9; $DIMENSION" | bc)"
sed "s/@[email protected]/$ASPECT/g; s/@[email protected]/$WIDTH/g; s/@[email protected]/$HEIGHT/g; s|@[email protected]|$IMAGE|g" > "$OFILE.edc"
For the record variety is a really nice app and supports moksha. Someone ask about it on our old forum and i fixed it to support moksha and then latter contacted one the devs working on it and the moksha patch got added. Last edited by rbtylee; 04-01-2019 at 04:51 PM. I said place it in your PATH. Yeah I left some details out. But anyways ... One important detail I left out is you need to have the dbus module loaded. Despite this hack working it is after all a hack and the module should work on its own without users applying some hack they found online. lol. This has lead to me taking a closer look at it. I fixed some minor issues I found and then spent way too long adding support for changing the background from an image without relying upon the above hack or any other exterior program. Along the way I had to learn alot of detail about how Moksha and enlightenment actually set and change the background. As usual for such projects this involved looking at alot of Moksha source code closely, adding debug statements to print the values of various variables in Moksha functions and whatnot. Meanwhile Štefan added a few minor improvements including a border around the image in the module gadget. While I hinted at above making implementing this background change Štefan's project, I released that would be rather difficult for him and take alot of time. And in the process I would end up having to answer quite a few questions from him. So may as well do it myself. And I confess it was a little harder than I expected and as usual took longer than I hoped. Regardless, I am uncertain whether to package this as it is now or to wait until we finish modernizing the module and fixing whatever issues I know about or find in the process. This round of changes was focused entirely on the background change functionality from image files displayed in the gadget. Focused entirely on one file in the modules source code.I really didn't look over any of the other files or functions. Any opinions on packaging now or waiting some undetermined amount of time? Just to let you all know, I downloaded the Moksha-module-slideshow from the repo and used gdebi to install. where .edj files are stored - /home/bodhi/.e/e/backgrounds. HOORAY! My background is changing as I wish. Thanks to all who helped with this. Is the slideshow module a replacement for the photos gadget? Seems the case, but that is a guess. is now needed at all? Last edited by the_waiter; 04-03-2019 at 03:20 PM.